Toronto Dominion marked its 150th anniversary in 2005. 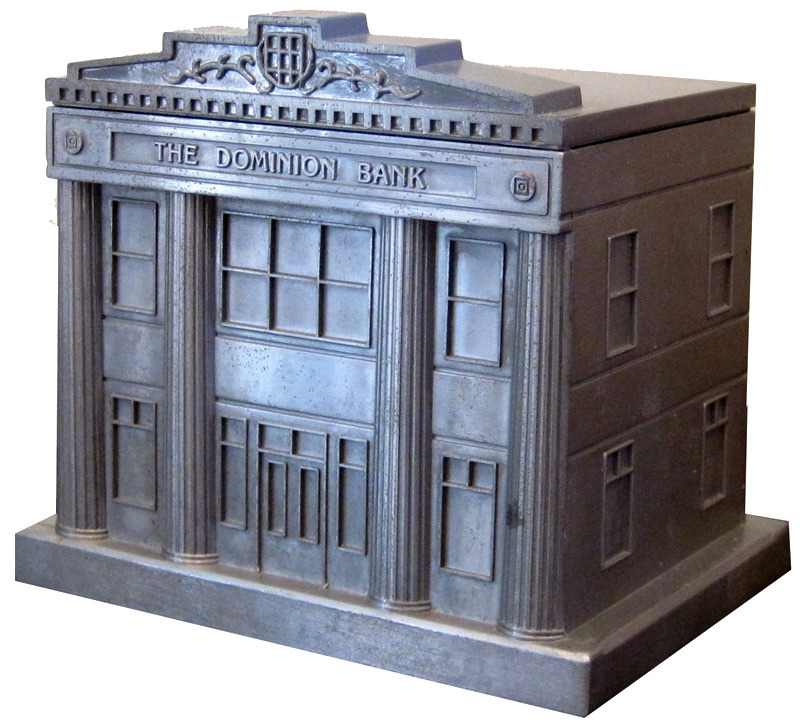 To honor the occasion, the bank, founded in 1855 and known today as TD Bank, had coin banks produced and gave them to customers of the Toronto Dominion Bank and Canada Trust (a trust company owned by TD). To learn more about the bank replica, I contacted the TD Bank Group Archivist, Anne, who told me This coin bank does not represent the first Dominion Bank building. “I believe it was just chosen because the architectural style worked well for a coin bank. Unfortunately that building no longer exists (replaced with a new bank branch in the 1960s), Anne said. “This coin bank was distributed as in 2005 as part of TD’s 150th Anniversary celebrations. It was modeled after one of the Bank’s branches in Brandon, Manitoba.” As souvenir building collectors, we like to own miniatures that are replicas of actual buildings. Even though the building may be gone, I hoped to find a historical image of it to compare to the miniature. I searched high and low for a photo of the branch building that is depicted in this coin bank, but can’t find a match. First, I found this building in Brandon Manitoba, but it does not look exactly the same. This bank, at 678 Main St. in Winnipeg, is similar, but still not the one. The, I found this one, formerly at 420 Bloor Street East in Toronto. Closer, but still not quite a match for the coin bank. Just as curious is a Canadian post stamp, also issued in 2005, shows a bank building that looks just like the coin bank replica. According to the Canada Post website, “The stamp is a collage of layered images from the past and present. Architectural details from a turn-of-the-previous-century TD building blend into the facade of the iconic TD Tower in downtown Toronto.” Still, no clues to the location. Anyone know where this building might have been?